So this is kind of a different blog post…but my original intention of my blog was to showcase a myriad of things that I feel benefit the world, and everyone in it! If you haven’t noticed yet, my passions lie in several different avenues…some that mesh together and some that don’t seem to hold any common ground. But one thing is for sure, fashion and music form a special bond as art forms that are universal and have the power to make great change. When I first started DJing in 2008, one of my greatest inspirations was producer J. Scott G. of Deepsky, an influential electronic group that rocked dance floors and dreams in the late 90s and early-to-mid 2000s. I consider myself to be a bit of a networking queen, which began when all I wanted to do was tell musicians that changed my life, face to face, how much I appreciated them, as I know being a music artist in this world is not an easy one. As my networks grew, that sprouted into a genuine love of playing the matchmaker of similar minds, introducing people and helping others continue their networks to advance their dreams! Recently, and thanks to Facebook (see, some good comes out of that cluster of a social media platform), I was able to get in touch with J. Scott G. and had a chance to meet him and his fiancé Naomi for drinks and dinner in Ventura, CA. It was then that I learned of his next venture in life. No longer a regular of the nightlife scene, his passions now lie in creating music for change. Prayer Song is the duo’s new life, which is a collaborative music project put together by people like you—thousands of voices from around the world are being collected to create a wholesome world choir to represent the need for world peace, the end of suffering, and overcoming our own obstacles and boundaries. Launched on January 22nd, 2016, the project is gaining traction and even earned a non-profit status thanks to HOPE! I was extremely tempted to post another collection of pre-Christmas holiday sales, but I figured I would do something else. Don’t get me wrong, I love a good sale during the holidays! But, I find it funny that as I get older, Christmas becomes more exciting when I have something I am excited to give. So, I thought instead of a sale post, I would share this company I just found, which has a mission of giving year-round. Sackcloth & Ashes, which was inspired by founder Bob Dalton when his mother found herself living on the streets in 2013. After realizing that many end up this way despite their best efforts in life, Bob decided he wanted to do his part, and called homeless shelters around his area asking what they they needed the most. 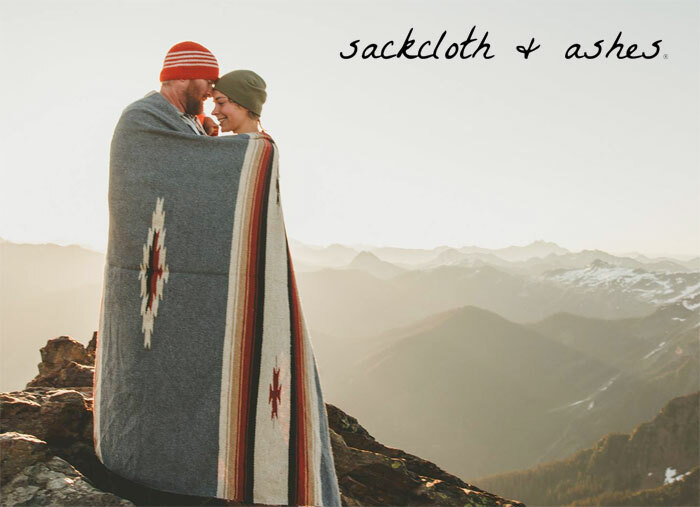 Blankets was the answer, and Sackcloth & Ashes was born. For every high-quality blanket purchased, the company will donate one to a local homeless shelter near you. Since their inception, they have given over 4,500 blankets, and was helped with the generous promotions of InStyle Magazine. TOMS has always been a leader in ethical shopping and charity, donating one pair of shoes to a child in need with every shoe purchase with their One for One® campaign. Now, the company has added coffee to its repertoire, promising to give one week of clean water to a person in need with every bag of coffee purchased!